The Large Size is 8.5 inches x 11 inches (215mm x 280mm), A4, and comes with a protective sleeve. The Medium Size is 3.1 inches x 6.1 inches (80 x 155mm), with a black vinyl carrying pouch. 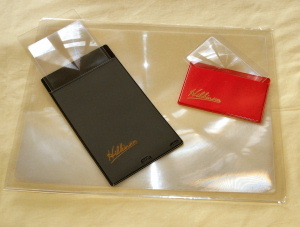 The Small Size is 2.2 inches x 3.3 inches (55mm x 85mm), with vinyl carrying pouch. The flat plastic sheet acts as a magnifier by holding it over a page at a distance of about 4 inches and the page is easy to read. It is lightweight and easy to use. Ideal for studying small print, maps, stamps, telephone directories, newspapers and magazines. It has a wide field of view.